As you know, we’re big fans of charity shops but I am quite fussy about cleanliness (Ha ha, Mr Jane Makes would say, obsessional more like!). Anyhoo, this does mean that I subject charity shop clothing purchases to a close inspection and sniff before I buy them and everything goes straight in the wash when we get home. Mr J-M is less fussy and has been known to wear something immediately without sanitisation! 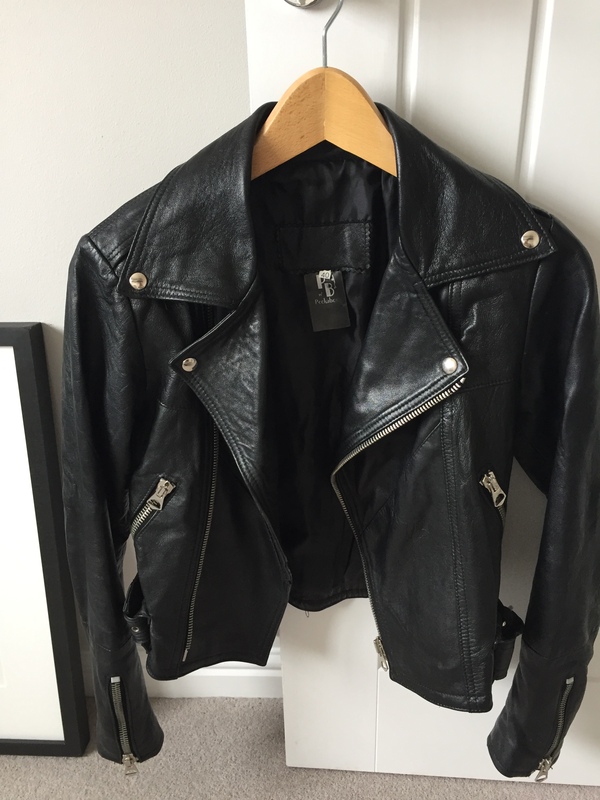 I’d been looking out for a black leather biker jacket for ages and when I spotted one in the Cancer Research shop I grabbed it straightaway, despite a slightly stale whiff. When I took it to the dry cleaners the following day I discovered it would cost £50 to clean it. I’m not that keen on dry cleaning at the best of times and I balked at spending that much with no guarantee of a good result. I remembered I’d once had to handwash some leather gloves after they fell into a muddy puddle in a car park and weren’t discovered until I returned to the car several hours later! I decided to throw caution to the wind and wash the jacket. I found and ordered this product online. It was cheaper on Amazon but seems to be currently out of stock. It does say it can be used to wash leather in the washing machine but I decided that was a risk too far. The bottle that arrived was a good deal smaller than I was anticipating and the instructions said to use between a third and half the contents for one wash. I ignored that and just used a couple of generous squirts in a sink full of tepid water. I swished the jacket around for a few minutes, giving the lining a good scrub. The water turned a very murky shade but I think (hope) that was the colour coming out of the leather rather than dirt! I gave it a couple of rinses in fresh water. Again I ignored the instructions which said to rinse once to allow some of the conditioners in the shampoo stay in the leather. Not surprisingly the jacket was soaking wet and impossible to wring out so I hung it on a plastic hanger in the garden overnight. Once it had stopped dripping I transferred it to a warm room for a day and finally popped it into the airing cupboard for a few hours. The aim was to ensure that it dried slowly to avoid it turning crispy! Once it was completely dry I put it on and performed a few contortions to stretch it back into shape. The final step was to use some of this to feed and soften the leather. 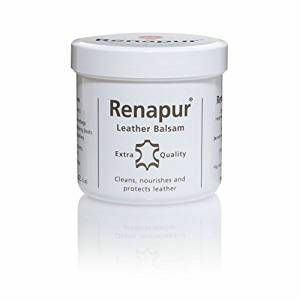 We’ve been using this balsam on shoes for years. It worked really successfully on the jacket. The leather is lovely and soft and the smell has gone. The shampoo was expensive but I’ve now passed it on to my sister who has three jackets to wash so the cost per wash will work out considerably cheaper than dry cleaning. To be honest, now I know it is possible to wash leather successful I’d be inclined to use a gentle wool wash next time which would work out much cheaper. I’ve also bought a new pot of balsam but the previous one lasted years so it’s pretty good value. I know I posted very recently about my first Gable but the main reason for a further report so soon afterwards is because of this fabric. I just love it! 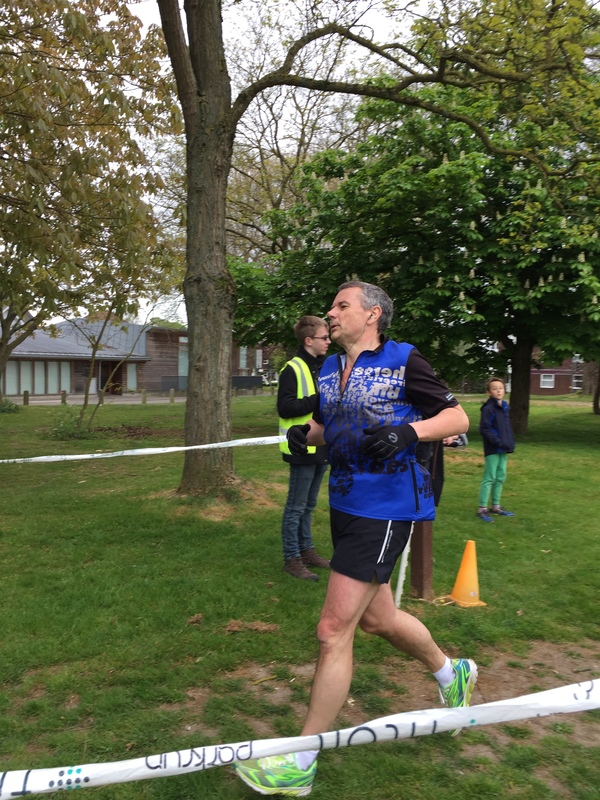 It’s the eco-jersey I bought from Ditto during the recent Portslade meet up. I’d seen it online but decided to wait until I could actually touch it. Once I had there was no way I was leaving without it. This fabric is made without the use of chemicals which is reassuring because who wants formaldehyde (amongst other things) next to their skin? This is also just about the best jersey I’ve ever sewn with. The level of stretch was perfect and it has good recovery. It is REALLY soft and the edges stay flat and smooth when it is cut. It also washed very well and didn’t distort. I made up the Gable in no time and wore it on Day 14 of #mmmay17. I think because this fabric is firmer than the one I used for the first version the neckline felt slightly too high and began to feel like it was choking me. Then my mother pointed out that it looked a bit high so I couldn’t stop thinking about it after that! The beauty of this top is that the neckline is sewn right at the very end. The instructions state that it should be sewn with a long straight stitch so it was very easy to unpick the front neckline, drop it down slightly and re-sew. I wore it again on Day 17 and although it doesn’t really look any different, it does feel much better. The Gable is definitely the top I’ve always been looking for and I will be making more. Hopefully in chemical-free jersey. If you follow me on IG you will have seen all this already so feel free to look away now. This is the third year I’ve taken part in MMM and each time it’s had quite an impact on the way I view the contents of my wardrobe. Since May 2015 I’ve almost stopped buying new RTW clothing and this year, although it wasn’t part of my specific pledge (which was to wear at least one me-made item a day), I’ve decided to be pretty ruthless to make sure everything fits/is comfortable/doesn’t have holes in it. If I’m not happy with something it will either get altered straightaway or sent to the charity shop. Here’s what I’ve worn so far. Tights are very much in evidence, as are scarves! And curtain fabric turned into skirts and dresses! Coco top from Day 2 is in the recycling bag. I’ve never really liked the fabric and it has gone a bit bobbly. Skirt from Day 3 – one of my all time favourites – has had a new invisible zip inserted. I made this skirt before I mastered the invisible zip and my centered zip wasn’t up to much! Skirt from Day 4 has been taken in as it was too big round the waist and is being worn again today. The Gable top from Day 14 has had the front neckline dropped slightly and no longer feels like it is choking me! Also being worn again today. I’m pretty happy with everything else. Day 10 was a bit of a cheat because I was so keen to wear a dress I’d bought from a secondhand shop and just couldn’t wait until June! I did use one of my Anya bags made from the pattern by Zoe and as she is the creator of MMM I decided it was OK. I never think I’ll being able to keep up daily posts on IG as I HATE having my photograph taken but I’ve even posted a proper photograph taken by Mr Jane Makes. I’m usually hiding behind my phone with a mirror selfie! Thank you to everyone for all your lovely comments – it really boosts my confidence. Another reason I’m glad of the daily photographs is that I’ve been able to make this comparison. Regular readers will know all about Mr Jane Makes’ heart attack last June and his pretty impressive four stone weight loss since then. The stringent portion control and lack of inappropriate food around the house + increased exercise had a beneficial effect on me too. Here I am wearing the same skirt in May 2016 and May 2017. Since last May the skirt has been taken in – removing a total of four inches from the circumference of the waist! Looking forward to the rest of May – and hopefully some better weather! It’s pouring with rain at the moment and I’m back in tights. I finished this top a while ago but when I posted a photo of it on IG as part of #mmm17 I realised I’d never blogged about it. I think it’s worth a mention. This is a re-issue of a 1960s pattern which I bought after seeing the version @lois.h posted on IG. I was planning to make a top to go with my Christmas skirt but never got around to it. In my quest for the perfect top pattern I decided give it a try with some pale grey denim twill from Fabworks. 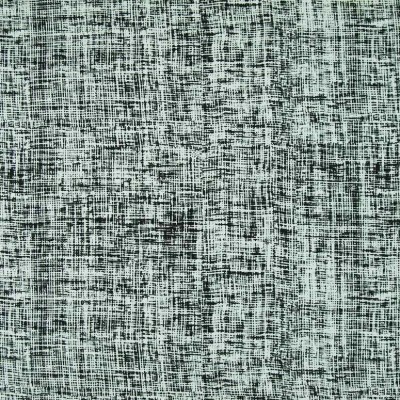 It was only £5 a metre but I’ve noticed that it is now sold out which is a shame. I was worried it would crease badly but even after wearing the top to work all day it looked fine. The pattern has long side seam darts which didn’t need adjusting and a lovely neckline (I’ve explained before about my preference for a high neckline!). I would say that it’s not quite the same neckline as the illustration, I was expecting it to be more like the Gable Top, but I’m fine with the way it turned out. The only adjustment I made was to the sleeves which were, as always, too long. There’s a elbow dart which had to be moved to make sure it was level with my elbow. It’s a pretty quick and easy sew and a definite wardrobe staple. My version isn’t quite as fitted as the cover illustration and I may add a bit more shaping at the waist next time. I’m hoping it will also work tucked into a skirt. It has a long invisible zip at the back which I have to admit was unpicked a couple of times. The zips previously stocked by C & H Fabrics are apparently no longer available and I’m not so happy with the alternative they now sell. I think the one I used in the end came from Ditto and it’s fine – but there is a teeny mess at the bottom as a result of the unpicking. I’ve not photographed it because I’m gradually learning to ignore it! I edged the facing with bias binding because I like the neat finish it gives. I’ve seen a lovely sleeveless version of this top by Sew DIY in black and white gingham which would be perfect for the summer – if and when it arrives! I also have this lovely vintage fabric I bought from Anna at The Eternal Maker. Her grandmother made a dress for her aunt from it in the late 60s and I have what was left over! Might be a perfect match with this 60s pattern! Once upon a time I commented on an IG post by Karen from The Draper’s Daughter and as a result we met up IRL and became friends! Karen is a stockist for Merchant & Mills and having seen her version of the Top 64 I bought the pattern. It sat in the waiting to be made pile for months but after spotting Sal’s top on IG (@sewingunlimited) I was finally inspired to get on with it. I had a remnant of a crinkly fabric with a tiny stripe from C & H Fabrics which I thought I’d try for the first attempt. I was particularly keen on the pockets hidden within the front horizontal seam and the raglan sleeves which are made up of two separate pieces (i.e. front and back). I do like the utilitarian packaging and presentation of Merchant & Mills patterns, although I think the illustrations may not be sufficient for a complete beginner (and I spotted a typo on the envelope!). I traced off the Size 8 and made no initial adjustments even though I knew the sleeves would be way too long on me. Everything came together very easily, especially the pockets, although I didn’t follow the instruction to secure the pockets down the back of the garment. Instead I marked the stitch line on the front with chalk and used that as my guideline for top stitching. I did end up with a rogue triangle of fabric sticking up at the top of the sleeve – I mentioned this to Sal and she didn’t have the same problem so I had clearly done something wrong. My remedy was to chop it off, add the neck facing and pretend it hadn’t happened! I was right about the length of the sleeves! Here’s the finished garment before hemming. The sleeves extended way beyond the ends of my fingers! I prefer three-quarter length sleeves even in the winter so in the end I shortened them by about 20 cms. This wasn’t the best fabric. It doesn’t press that well and didn’t appreciate having iron on interfacing attached to it but, despite that, I think it worked really well for this top. I wore it for the sewing meet-up previously blogged and it is so comfortable to wear. My favourite thing is definitely the pockets. I noticed a photograph of a dress version in the pattern details on the website which isn’t mentioned on the pattern itself. I definitely think that would be worth a try. I made a feature of the cross stitch used to secure the facing to the garment on the shoulder and back seam using embroidery thread which I really like. Another pattern I’d recommend and next time I’ll aim get the top of the sleeve right! Who could refuse an invitation from Zoe to an exclusive visit to Ditto and The Fabric Godmother during the bank holiday weekend? I’ve been to several of Josie’s open days at her fabric headquarters but this time we were visiting Ditto’s unit in Portslade where the online orders are processed and Gill has been holding some open days recently. Mr Jane Makes kindly dropped me off at Ditto after finishing his park run (a personal best at 25:40) and chose to change from his running gear into ‘normal’ clothes when we arrived. Emma from @dressmakerssocial did mention later than she’d spotted him out of the window in his pants. I hope she gets over the experience soon! He has no shame. I’ll spare you a photograph of him in his smalls! I nearly forgot – Zoe also brought her adorable baby, Frankie. Given that he had to spend several hours being passed around his adoring fans he was as good as gold! Being faced with all this fabric as we walked into Ditto was overwhelming! This is just part of one room – there’s another one too! There was also a table piled up with homemade cake. I never remember to take proper photographs but the image on the right shows Sal, Louise and Vicki having an animated conversation whilst clutching fabric! We were very well looked after by Emma’s daughter who took orders for hot drinks and her son recorded an interview with everyone, asking them to choose their favourite fabric and say what they were going to make with it! As if that wasn’t enough fabric for one day – off we went to The Fabric Godmother. Josie had very kindly prepared lunch for us and Claire supplied chocolate brownies. Claire has something of the Mary Poppins about her and is able to produce pretty much anything you might need from the depths of her handbag including plastic bags for take away cake! Some people were more restrained than others. I’ve been committed to curbing my fabric buying recently, sticking to using up what I already have and seeking out secondhand fabric in charity shops. However …. 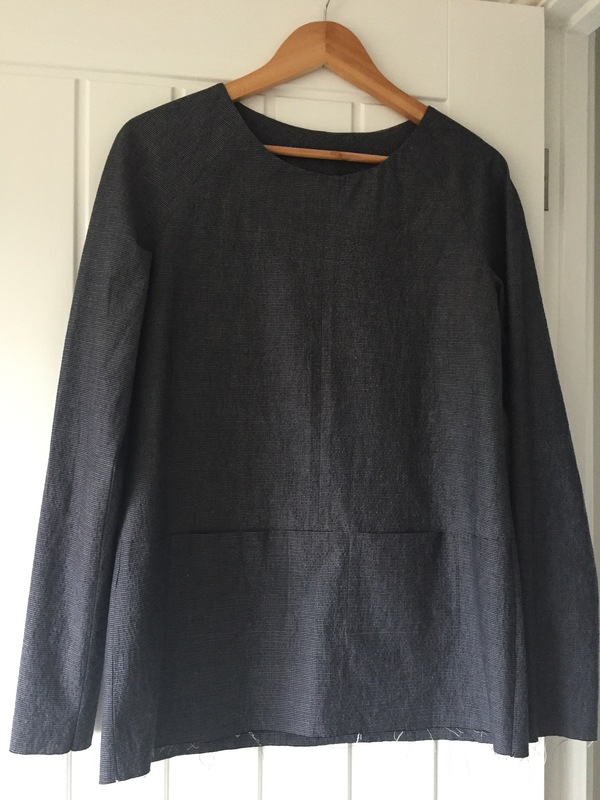 I had already spotted an eco jersey on Ditto’s website which is produced without the use of harmful chemicals and once I’d seen it IRL decided it would make a perfect second Gable Top. Here’s my first one. At The Fabric Godmother I succumbed to some mustard/gold denim. I’ve had this fabric before to make a Brumby skirt which is now too big for me and although I’ve done a lot of alterations recently I just can’t face unpicking the waistband and dealing with all that gathering. 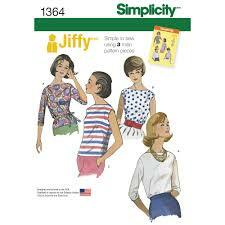 I may not necessarily replicate the Brumby but the fabric will definitely become another skirt. I was also looking for some grey denim which I also found at TFG. This may well become a Cleo dress. I’m very late to the Cleo party but Louise’s version in sparkly denim finally decided me. One of the highlights of the day was our goodie bag from Josie. 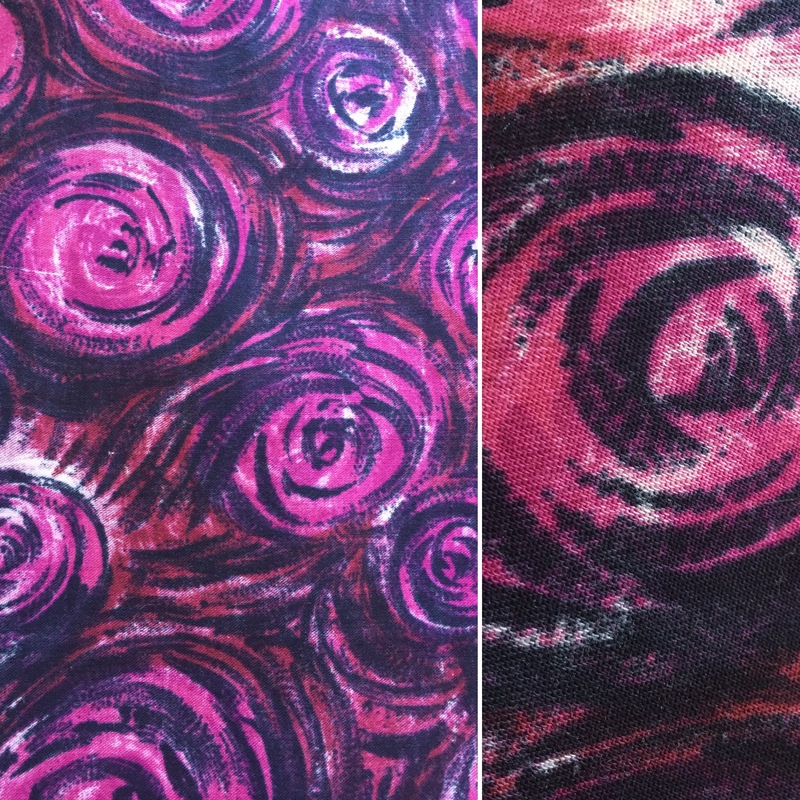 I didn’t open the package until later in the day when I discovered we had all been given a length of this amazing floral fabric and a pattern! So generous. It is not something I would normally choose for myself but it is beautiful and I’m going to think very carefully about what I make with it to ensure I do it justice. With fabric and cake in hand I headed off for Portslade station to catch a train back to Brighton to meet up with Mr J-M at my sister’s house. Thankfully it’s only two stops because the train was rammed with Brighton supporters who had clearly already been to the pub and were singing some fairly inappropriate songs, the lyrics of which I won’t repeat here! They were probably not as cheerful by the end of the day after losing the match. A huge thank you to Ditto and The Fabric Godmother for a great day and for the great organisation by Zoe, Stevie and Claire.